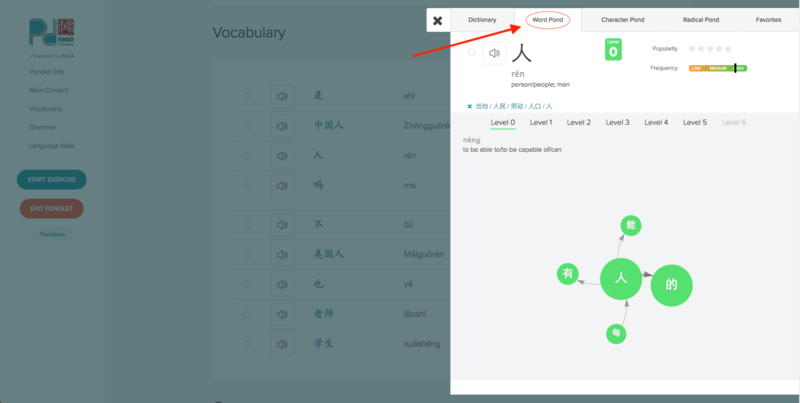 While learning vocabulary through the Word Pond Panel, you may notice the “Word Pond” tab that appears second on the Word Pond Panel. Word Pond takes the word that you are learning and shows how that word interacts with others in sentences. This is a result of a research that uses approximately 600 million Chinese words from various media written and spoken by native speakers. By learning how the vocabulary is used with others in context, the tool helps you create your sentences that are natural and relevant to your context. After opening the Word Pond Panel by clicking on a vocabulary word in your Pondlet, you can access Word Pond tool by clicking the second tab on the top. 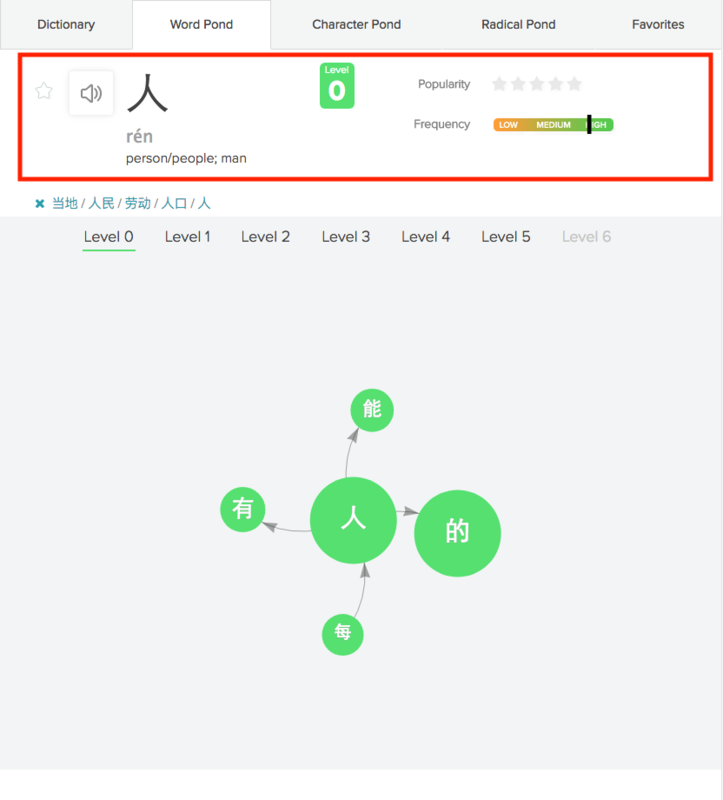 In this case, after clicking the 人 character in your Pondlet, proceed to click one more time on the Word Pond tab as shown below. Word Pond can be differentiated by two main sections. 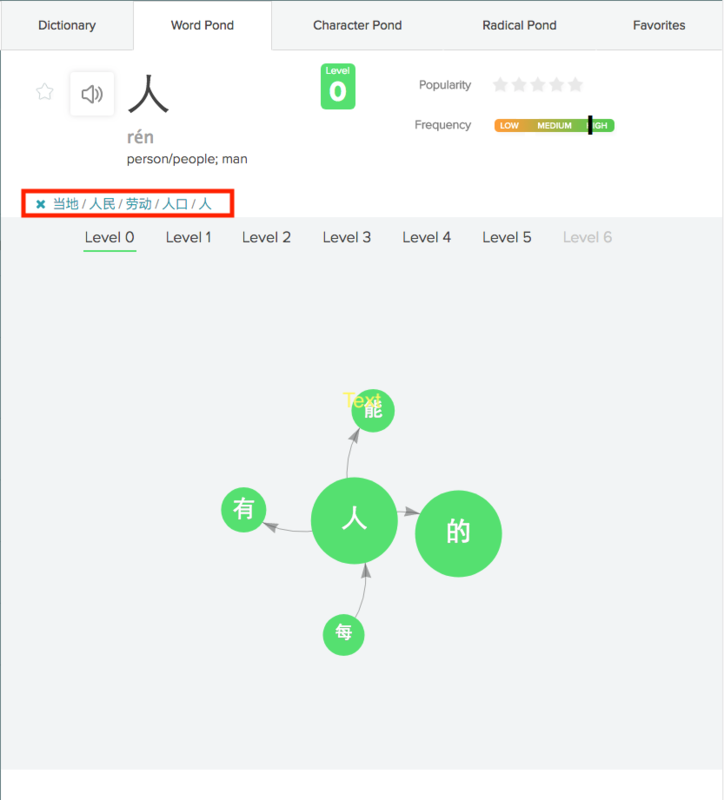 This first section provides all the general information about the word including: the character itself, its pinyin, the definition, level of difficulty, its pronunciation, along with how often it is used in natural language. The second section, distinguished by a grey background, is where the Word Pond tool is located. It contains a core (the word you are studying) and multiple satellites (words that are commonly used with the core). 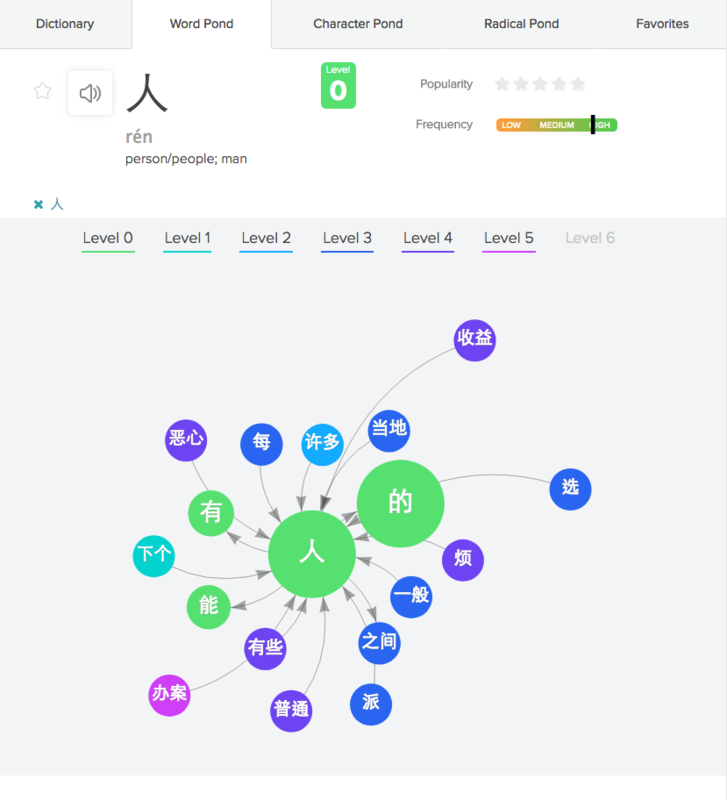 You can click on one of the satellites, turning it dark blue, and the pinyin along with the definition will show up at the top left corner of the section. If you double click instead, this will turn the satellite into the core word. Each time you make a satellite the core, a history bar will show up displaying all the previous cores as shown below. This allows you to go back to each previous core by clicking them accordingly. In the circle diagram, size correlates directly with frequency. 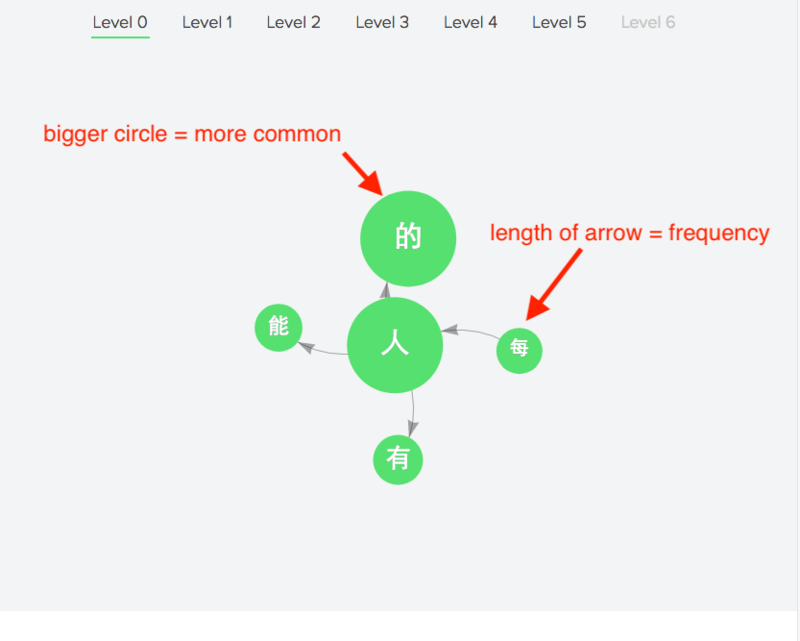 The size of each circle show the relative frequency of the word that appears in common language while the length of each arrow show the co-appearance (how often they are used together). If the distance is short, it means the word pair are used together often in sentences. The direction of the arrow shows the order of the pair that appears most commonly in a sentence. Finally, you can select the different levels of difficulty using the filters to find words that are for your appropriate level of difficulty. This allows for the practice of recycling which enables you to revisit and master words that you may have forgotten. It can also be a way to discover new vocabulary that might interest you. In the picture below, each levels is highlighted and distinguished by different colors. 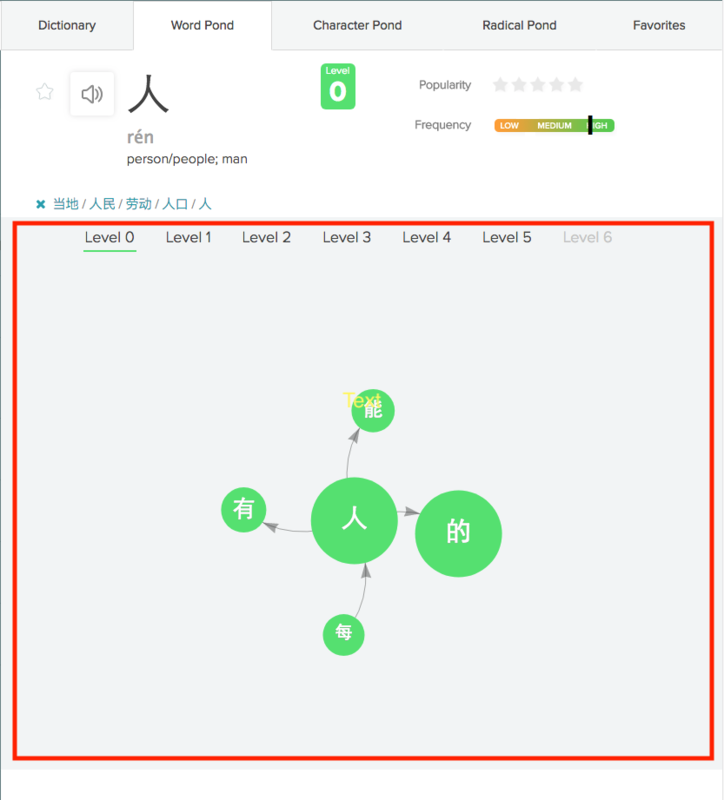 The Word Pond is a set of powerful tools that will help you understand sentence structures in the Chinese language and also let you discover new ways to use the vocabulary that you have learned.